30 June 2014: The latest annual assessment report of energy and carbon savings secured through the Mayor’s planning requirements has just been published by the GLA. An energy assessment is required for each planning application referable to the Mayor, setting out how the London Plan energy policies will be met within the development. Specifically, applicants are required to set out how the planning applications apply the following energy hierarchy: Be lean: use less energy / Be clean: supply energy efficiently / Be green: use renewable energy. Further information on the London Plan energy policies can be viewed here. circa £17 million of investment in combined heat and power (CHP) plant able to produce 25MW of electricity and a similar amount of heat – broadly equivalent to the amount required to supply 50,000 homes. Regulated CO2 emission reductions of 36 per cent more than required by Part L 2010 of the Building Regulations. 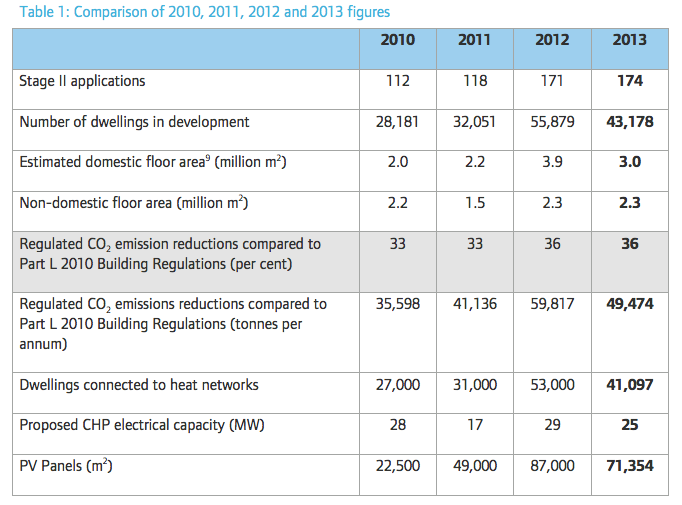 This represents a circa 30 per cent regulated CO2 reduction compared to the new 2013 Building Regulations (ie London Plan policies are already directing developers to energy strategies delivering 30% more CO2 savings above the government’s new building regulation requirements, which came into operation in April 2014). Also provided is a summary of what has been secured over each of the past 4 years as a result of the London Plan’s energy policies. And over 230,000 m2 of PV is to be installed. District Heating in Pimlico: Analysing the social contract created through energy infrastructure available here. “…scientists are being told to use art and poetry to win public support in the battle to curb climate change. Dame Julia Slingo, the chief scientist at the Met Office, has called for a radical overhaul of the way climate scientists go about their business, arguing that they need to make their reports less turgid and more engaging. “We have to look increasingly at what society requires of us… We increasingly recognise that to reach the general public we have to use all sorts of different channels of communication,” Dame Julia told a recent gathering of leading climate change scientists at the University of Exeter. 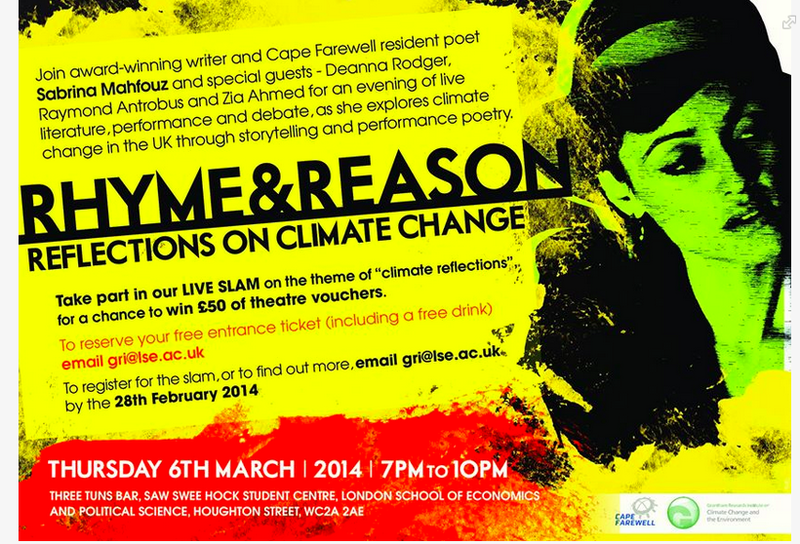 With this in mind, its interesting to see that an event took place over the weekend in Hackney, as part of a programme called The Spark, entitled ‘Using hip-hop and music to empower communities and tackle Climate Change’, and earlier this year the Grantham Research Institute on Climate Change held a novel poetry slam ‘Rhyme & Reason: Reflections on Climate Change‘ evening (poster below), performances from which can be seen here – and additional details of the night here. June 2014: Academic research from 2013 examining a model “developed to explore the sensitivity of the London economy to loss of production capacity in sectors affected by climate change related damage.” The paper is fully downloadable here. June 2014: DECC have just released their 2014 Annual Fuel Poverty Statistics Report, accompanied by a dizzying number of data sets (all for 2o12), which attempt to detail fuel poor households by housing type, who lives there, by region etc.etc. The headlines of all this work is that government estimate that, in 2012, absolute numbers of fuel poor households had fallen slightly, when compared to previous years, to approximately 10% of all households in England. The overall change in the number of households in fuel poverty was relatively small – with the reduction happening mainly due to income increases for higher income fuel poor households. However, it’s also reported that the number of households in fuel poverty is projected to increase in 2014, with increases in energy costs a key factor. The much higher incidences of fuel poverty in unemployed households, and those living in privately rented accommodation. Though the data indicates a lower proportionof fuel poor households in London than other regions (attributed in the report to higher incomes in London and greater access to the gas grid) the findings above are of particular importance to the capital due to the high (and increasing) number of households living in the privately rented sector, and the much lower levels of activity achieved by the government’s energy efficiency programmes in London. The recent changes adopted by government in how to define when a household is in fuel poverty (as set out in the government’s 2013 ‘Fuel Poverty: A Framework for Action) – under a new ‘Low Income Household Costs’ (LIHC) indicator – specifically takes housing costs into account for the first time. Not surprisingly, this was thought to have a significant impact to the numbers of fuel poor in London due to the higher housing costs observed in the capital – with a predicted near 50% increase in the number of fuel poor households (see here for details). The Fuel Poverty report doesn’t however appear to provide any commentary on how differences between regional housing cost differences may have impacted on fuel poverty numbers. 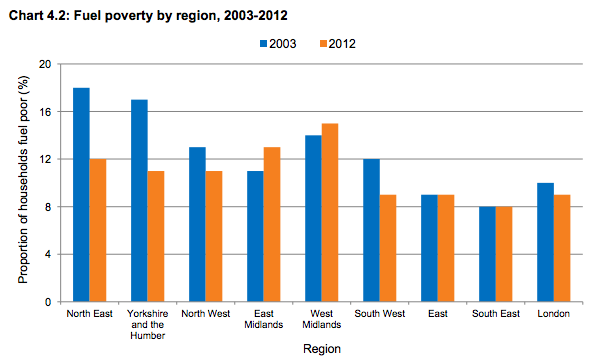 Though the proportion of fuel poor households in London is estimated to be lower than most other regions it can also be seen from graph above (copied from the report) that London has seen a much smaller drop across the decade in the number of fuel poor homes than other regions. The key data breakdown for London is set out in a separate spreadsheet document – the ‘2012 sub-regional fuel poverty data: low income high costs indicator‘. The data includes a local authority breakdown of data and reports that Newham has the highest incidence of fuel poverty in London with close to 1 in 7 homes deemed to be fuel poor, followed by Harrow, Brent and Waltham Forest. Table 3 of the dataset breaks down the local authority data further to ‘Lower Super Output Area’. 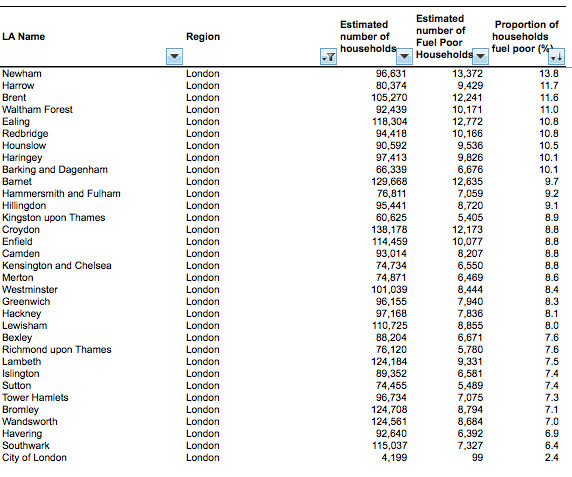 Data on fuel poor households by London Parliamentary constituencies is also provided. ‘Fuel Poverty Trends 2003-12’ provides long term trends under the new Low Income High Costs (LIHC) indicator including a time series on number of households estimated to be fuel poor. The data for London is copied below and indicates that the proportion of London households in fuel poverty initially dipped in the early party of the century, but has increased again, hitting a maximum of 13.2% in 2010, before falling again slightly. The ‘Fuel Poverty Detailed Tables‘ provide limited regional information, but provided data on fuel poverty by housing type, age of residents, age of dwelling, energy efficiency of dwelling, working status, tenure etc. An additional indicators note is also available here. June 2014: Interesting to note that the London Assembly Economic Committee are to hold an evidence session on 24 June 2014 at City Hall on ‘Risks of Climate Change to the London Economy’. The meeting is to take place at 10.00am in Committee Room 5 . This is the first meeting for the Economy Committee’s new investigation into the resilience of London’s economy to the projected impacts of climate change on the city. A briefing paper drafted for members of the committee can be downloaded here. To make recommendations addressing the risks from climate change to the London economy to the London Enterprise Panel and the Mayor, and potentially other representatives of London Government where appropriate. The Mayor has previously stated that TfL has extreme weather resilience action plans for each business area. London’s 2011 Climate Change Adaptation Strategy can be viewed here. and do all this to in time for the Fund go-live in September 2014 [with the Fund likely to be launched by Ministers at the Local Authorities and Communities Conference organised by DECC and Oxford City Council, which is to be held on 4 September. This conference will be followed by the Community Energy Awards – details here]. The deadline date for organisations to apply to the tender is 21 July 2014. Submit a business case related to the project that are requesting funds for, with this business case to be assessed by the fund administrator. A recent presentation by the Head of DECC’s Community Energy Team (at an event held on 11 June launching the results of the Kingston smart communities project) provides some additional background to work being undertaken to support the uptake of community energy. His advisor and officers have already started meeting a few community energy groups operating in London. Stage one will be a grant of up to approximately £20,000 for feasibility of renewable energy projects. Stage two will be a loan of up to approximately £130,000 to support pre-planning development work, planning applications and to develop robust business cases to attract further development. Details of the Fund have as yet not been fully announced by DECC as yet, but a new Community Energy Unit has been established in DECC and will be leading on its delivery.